The Audi Elaine debuted as a concept in 2017, however is now close to production stage. It boasts an exterior length of 4.90 meters (16.1 ft), a width of 1.98 meters (6.5 ft) and a height of 1.53 meters (5.0 ft) with a wheelbase of 2.93 meters (9.6 ft) position the Audi Elaine in the C segment, close to the Audi A7. Digitally controlled Matrix LED units at the front and rear produce an excellent light yield. Minuscule Digital Matrix projectors literally make their mark on the road ahead, turning light into a versatile, dynamic channel of communication with the surroundings. Other road users can also be informed of the various driving modes, such as when the vehicle is driving autonomously. The Audi Elaine uses a configuration that Audi will use in future production models with all-electric drive: One electric motor on the front axle and two on the rear power all four wheels, transforming the high-performance coupé into a quattro in typical Audi style. The Audi Elaine will be equipped with advanced zFAS controller installed in the rear. The new generation processor has more computing power and refined sensors with even greater range and precision. Therefore,the car will be able to serve its owner as a highway pilot, relieving the burden on the driver over extended distances. The highway pilot is an extension of the traffic jam pilot in the A8 and allows piloted driving at speeds from 60 to 130 km/h (37.3 to 80.8 mph). When the highway pilot is active, the Audi Elaine changes lanes automatically – it can pass and then return to the original lane, for example. It can initiate, perform and complete such actions autonomously, without any involvement of the person behind the wheel. If the driver does want to intervene, they can do so spontaneously at any time. The networking of the car and the infrastructure is crucial for driverless mobility. The driver parks the Audi in a designated area (the handover zone) and exits the vehicle. From there, the car drives automatically and unoccupied into a multistory parking garage offering a variety of services, such as a car wash, a package station, a gas station or a charging post. Thanks to Audi AI, the car does all of this itself. Connected with its surroundings, the intelligent Audi can even locate an unmarked parking space on the side of the road and pull precisely into it. At the desired time, the vehicle is back in the handover zone, ready for its next journey. Drivers can follow the actions of their vehicle at all times and even add new tasks using an app. 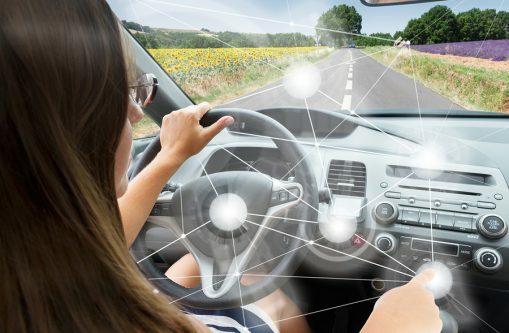 PIA, the personal intelligent assistant, uses artificial intelligence methods, combining data intelligently – data from the car, data about the driver, traffic jam reports and traffic projections, as well as information from the internet. PIA also responds to voice inputs and uses tailored algorithms to communicate autonomously and adaptively with the user. PIA gets to know the driver by observing their behavior patterns. This opens it up to use for a broad range of applications: navigation, selection of music, selection of the desired Audi connect service, climate control, suggestion of a parking space or maintaining the regular distance to vehicles ahead on the highway.